The Taylor Wessing Photographic Portrait Prize return is another success. The small rooms in which the 60 portraits exhibition is hosted are filled up with visitors. Despite the low entrance price the Taylor Wessing Prize 2011 confirms to be one of the most significant photographic exhibitions in the UK. The Taylor Wessing Photographic Portrait Prize 2011 has been won by Jooney Woodward, 32, for her portrait, ‘Harriet and Gentleman Jack’. The portrait of 13-year-old Harriet Power was taken in the guinea pig judging area at the Royal Welsh Show. Woodward says: “I found her image immediately striking with her long, red hair and white stewarding coat. She is holding her own guinea pig called Gentleman Jack, named after the Jack Daniel’s whisky box in which he was given to her. Using natural light from a skylight above, I took just three frames and this image was the first.” The winning portrait has unleashed critical comments. It seems many did not agree with the portrait to be the winner wondering if this was really the best in between the 6,033 portraits submitted by 2,506 photographers from around the world. However, Woodward was awarded with £12,000. She found her sitter whilst scouting subjects at the agricultural show in Builth Wells, Powys. The portrait was shot on film with a Mamiya RZ medium format camera. Born in London in 1979, Woodward studied at Camberwell College of Arts, specialising in photography. She worked in the Vogue Photographic Archive of Conde Nast Publications before pursuing a freelance career from 2009. Jill Wooster with ‘Of Lili’ has been awarded with the Second Prize of £2,500. Born in1977 in New Haven, Connecticut, Wooster has lived in New York, San Francisco and currently lives in London. She studied as an artist at Bard College, New York. She currently works as a freelance photographer. Her portrait is of her friend, Lili Ledbetter and was taken at Wooster’s flat in Peckham. The Third Prize of £1,500 has been given to Dona Schwartz for ‘Christina and Mark, 14 months’ from the series ‘On the Nest’. Her shortlisted portrait is of Christina and Mark Bigelow from Minnesota in their son’s vacated bedroom. Born in the US in 1955, Dona Schwartz is an Associate Professor specialising in Visual Communication at the School of Journalism and Mass Communication at the University of Minnesota. The Fourth Prize of £1,000 was for Jasper Clarke for ‘Wen’. 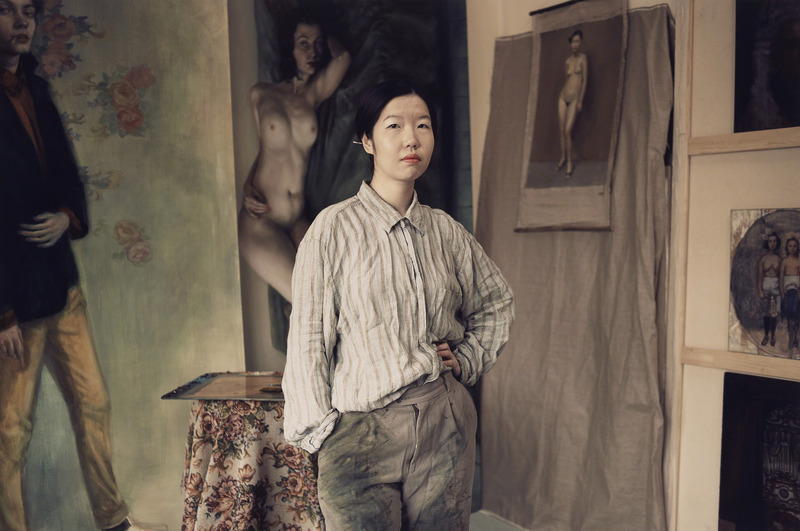 His shortlisted portrait taken in Hackney is of Wen Wu, a Chinese artist and is from a personal project depicting artists, musicians and other creative people who live in their work spaces. Jasper Clarke was also the winner of the ELLE Commission 2011 – in its third year. He will be given the opportunity to shoot a feature story for ELLE magazine. Born in the UK in 1978, Clarke studied at Edinburgh’s Napier University before moving to London to assist many high-profile photographers. David Knight with ‘Andie’ was awarded with the Fifth Prize of £500. His portrait of 15-year-old Andie Poetschka was commissioned by Loud for the Cerebral Palsy Alliance to raise awareness of the condition throughout Australia. Born in Oxford in 1971, he currently lives and works in Sydney. This is the fourth year that international law firm Taylor Wessing has sponsored the Prize.